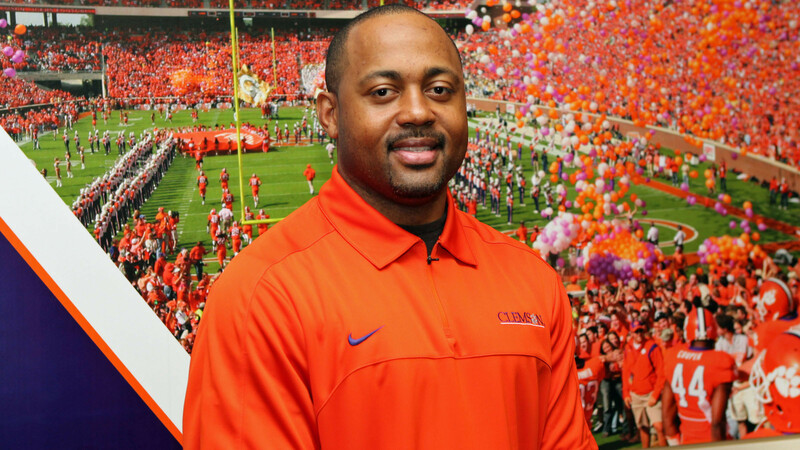 CLEMSON, SC – Mike Reed, most recently the defensive backs coach at NC State the last six years, has been named Clemson defensive backs coach. Head Coach Dabo Swinney made the announcement today. He replaces Charlie Harbison, who resigned at the end of the regular season to become an assistant coach at Auburn. Reed has been an assistant coach at the college level for eight years and at the NFL level for five seasons. He coached NC State All-American David Amerson, who ranks third in ACC history in total interceptions with 18. As a professional coach with the Philadelphia Eagles, he worked with former Clemson All-American and nine-time Pro Bowl selection Brian Dawkins. “I am excited to have Mike Reed join our staff,” said Swinney. “He brings the entire package. He is very familiar with our recruiting base. He is familiar with our players and he knows the ACC. “He has had great success at NC State in terms of coaching All-ACC players and has significant experience coaching at the college and NFL level. Reed helped the Wolfpack to four bowl games in his six years with the program (2007-12). That includes this season when NC State beat a top five Florida State team and played Vanderbilt in the Music City Bowl. NC State tied for the ACC lead in interceptions this year with 16. NC State defensive backs were also a big reason the Wolfpack led the ACC in third-down conversion defense, allowing just 27 percent. Three times in the last five years NC State ranked in the top 20 in the nation in interceptions, including this past year when the Pack ranked 20th with 16. The 2011 NC State team had 27 interceptions, the most by any FBS school since 2003 when Nebraska had 32. The total ranks in a tie for second most in ACC history, and the most since 1994 when Virginia also had 27 interceptions. That year, Amerson had 13 interceptions to lead the nation, five more than any other player. It is tied for the second most interceptions in NCAA history. Amerson also led the nation in interception return yards with 205 that year and tied for the lead in interception returns for touchdown with two. Amerson was a unanimous All-American in 2011 when he was also a Thorpe Award finalist and won the Jack Tatum Award. In addition to Amerson, Reed also coached many other all-conference players at NC State. Amerson was a second-team All-ACC cornerback in 2012, while safety Earl Wolff was a first-team selection. In 2011 Brandon Bishop was an honorable mention selection. Overall, four different NC State players made an All-ACC team in his six years. Prior to coming to NC State, Reed worked for the Philadelphia Eagles from 2002-06. He was a defensive backs coach and special teams coach in 2002 and a defensive assistant and quality control coach from 2003-06. The Eagles advanced to the NFC Championship game three times, 2002, 2003 and 2004. The team went to the Super Bowl at the end of the 2004 season and set a franchise record with 13 regular season wins. Dawkins was a key member of the Eagles secondary during that time and was regarded as one of the top safeties in the NFL. He made the NFL All-Decade Team for the 2000s and he made the Pro Bowl four of the five years Reed was on the staff. The Eagles finished second in the NFL in terms of fewest points allowed in 2004. Reed worked under legendary defensive coordinator Jim Johnson during his career in Philadelphia. Prior to his career in the NFL, Reed worked as wide receivers, tight ends and defensive backs coach at the University of Richmond in 2000 and 2001. He coached NFL player Stacy Tutt while he was at Richmond. Reed played his college football at Boston College from 1991-94. He graduated from that school in 1994 with a B.S. degree in communications with a minor in secondary education. During his college career he was an All-ECAC selection and a second-team All-Big East choice in 1993. He was one of four captains of the 1994 Boston College team. The native of Wilmington, DE played on three bowl teams that finished with top 25 rankings in the AP poll, including the 1993 season when Boston College upset number-one ranked Notre Dame in South Bend, a 41-39 victory that denied the Irish of the 1993 National Championship. He played three seasons for Tom Coughlin, who has gone on to win two Super Bowl Championships with the New York Giants, and his senior year for Dan Henning, who has also gone on to coach in the NFL. Reed was the last selection of the 1995 NFL draft by the Carolina Panthers and he played two seasons for that team, 1995 and 1996. He also played for the NFL Europe team in Frankfurt and was the team captain of the 1999 Frankfurt team that won the World Bowl Championship. Reed, who was born in August of 1972 in Wilmington, DE, is married to the former Kimberley Byrd of Boston, MA and the couple has two daughters, Michaela Rae and Milan Skye.